Do you bike in West Windsor? Want to prevent your bicycle from being stolen, especially at the train station and other public parking locations? Want to increase the chance of recovering your bike if it is stolen? Consider participating in the free bicycle registration program being offered by WWBPA and the West Windsor Police Department. WWBPA and WWPD are launching the free program this month as a service to everyone who bikes in West Windsor. It’s similar to the program offered at Princeton University for riders on campus and commuters at the Princeton Dinky Station. How does it work? Simply download a form, fill it out with your bike’s description and serial number and return the form to the police department or the WWBPA to get your bike registration tag. 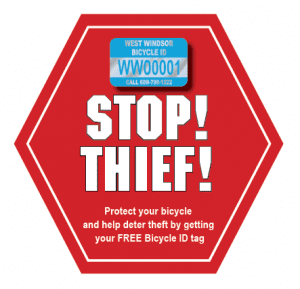 The self-adhesive aluminum tags attach easily to your bike frame (instructions), are very difficult to remove and make your bicycle less desirable to thieves. Each tag has a unique number and your registration provides the West Windsor Police with contact information that makes it easier to ID and return stolen bicycles to their rightful owners. Bike ID registration forms are available on the WWBPA website, West Windsor Police Department, 271 Clarksville Rd, or at police website and at various events where WWBPA appears, e.g. WW Farmers Market and other announced events. After you fill out the registration form, deliver it to the WW Police Dept. or WWBPA at the Farmers Market on alternate Saturdays to pick up your self-adhesive numbered ID tag(s) and have the tag numbers added to the registration form. We’re hoping to get as many bikes as possible registered so share widely with your friends, coworkers and family members. We’ll be offering bike registration at the Farmer’s Market this Saturday, July 13th and at any event in which we host a table this summer, so feel free to drop by and check it out. This entry was posted on Monday, July 8th, 2013 at 2:51 pm	and is filed under Bicycle-Friendly Community, BIke Locks, Bikeability, commuter, New Jersey Transit, Princeton, Princeton Junction train station. You can follow any responses to this entry through the RSS 2.0 feed. Both comments and pings are currently closed.